my favorite play of the game!!! Good win for you guys in a dominating fashion. Congratulations. Week three shall provide some great entertainment! Good luck to you guys and let's hope for an injury-free game! i have a weird crush on Chancellor. Even though Kams numbers are better and he doesn't really have any holes in his game. Alrighty. What numbers does he have better other than height and weight? He had more picks last year but half of them were gifts. Kam is a tremendous in the box safety who's solid and maybe even above average in zone coverage but shouldn't ever play man. He can also jack people up. Earl Thomas is a much better open field tackler for his size and really isn't that far behind Kam in that area or in blitzing. Kam's only real advantage is his size. Earl is a better ballhawk, better zone defender, and in an entirely different realm in man-to-man situations. Earl Thomas would look good in any defense. Kam Chancellor shows up most in a D where there's an Thomas/Reed/Collins (poor guy) opposite him. What? Kam is a MUCH better tackler and is just as good, if not better, of a ballhawk as proven by his turnover production. He can cover the big TEs of todays league extremely well in man and we saw Kam intimidate Witten today. That's valuable. Kam is much better against the run, much more of a mismatch with his size, and much more of an intimidator, that'd I'd much rather have him. I love that the flag on the play wasn't for Helmet-to-Helmet or leading with his Helmet, but rather on Bruce Carter for a phantom call. Brilliant. Tate clearly launched himself at Lee who was defenseless. I actually almost got into a fight when the flag was called on Carter and not Tate by a fan in the stands who threw ice at me and laughed. 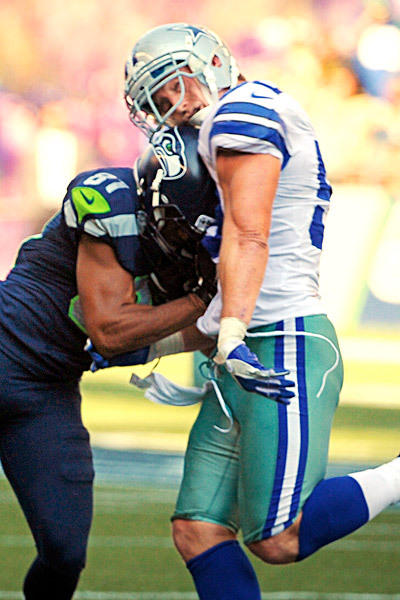 Anyway, the Seahawks played a complete game, and the Cowboys came out flat and terrible. There were alot of terrible calls in that game, but nothing that would have changed the outcome or the result. A few of the offensive drives that Seattle had would have stalled and took some points off the board, but we would have lost anyway. Something needs to change with our OL because it's atrocious and I was really impressed with how Seattle handled the Cowboys pass rush. Defensively the Cowboys played a good game, holding your offense to under 200 yards passing and only 14 points (surprisingly we couldn't stop the run to save our lives either)...but getting down by 10 early due to terrible Special Teams play by us and Seattle playing great, that and never being able to mount any kind of offense killed us. Props to Seattle, hope you guys can keep it up! Dak is very good at recognizing blitzs, makes audibles at the line, consistently stands tall in the pocket, immediately took command of the team as a leader. I'll say this. I had it as the key to this game to keep Murray under 20 carries. The Boys are undefeated when he hits that number, because it essentially means the defense was getting gashed. While we were consistently giving up 3 or 4 yards, we never let him break a big one and the Cowboys were forced to pass over and over again. Sherman wasn't even targeted in the 1st half of the game. He ended up having another nice day against some strong receivers. This game could have actually been worse than it was. Brandon Browner could've taken his INT back for a TD if Kam wasn't in his way. KJ Wright should've had that pick 6. That Dez Bryant fumble could've easily been picked up by us. We didn't score a TD off of the fumbled kickoff. A lot of mistakes on our part but we found a way to win. The biggest difference in the 2nd half, for me, is that we weren't getting driver-killing, momentum-killing penalties. Those really do ruin our whole tempo. Now that is how a team works out the kinks from week 1 to week 2. I will give my game ball to Frank Omiyale. He basically neutralized (and maybe neutered) Demarcus Ware. When I turned the game on and saw Omiyale in there I thought we were in serious trouble, but he played an epic game to keep one the elite pass rushers in the league off Wilsons back. The only play I can recall where he got crushed was when he got bull-rushed back into Wilson and it cost the 'Hawks a long TD pass to Tate. I believe it was the 1st down play after the Browner INT. Anyway, the whole O-line deserves credit for paving the way for Lynch as well. The cohesion they showed this week after looking lost and confused last week was a huge improvement. I will say that Dallas gift wrapped the first quarter for us. They were sloppy and it allowed us to play from ahead for the whole game. The receivers were atrocious, Witten dropped what 4 or 5 passes? Bryant dropped a couple and fumbled a punt. They really killed any momentum that Dallas could've built. And they started to in the 2nd quarter, but the drive Wilson led to get the FG before halftime was crucial. 2nd half was all Seahawks. Whatever PC does at halftime seems to be almost miraculous. Dallas was a ghost team out there. I loved seeing the 2 long drives that just demoralized Dallas. We will need those kind of drives consistently this year to give our D a rest and let them go balls out when they're on the field. Overall a great way to come out for the home opener and a great way to turn around last week's tough loss. On a side note, now the Arizona pulled an upset over NE combined with SF's 2 wins against playoff teams from last year, and the Rams being a lot more competitive than last year, can I say that the NFC West might be the deepest division in the conference? There is a lot of season to go and the national media will never say this, because they live in the prison of their time honored biases, but at this point the NFC West is on the rise in a major way. Good game fellas, wooped us something fierce. That was definitely a huge part of the success yesterday. Taking 13 penalties, no matter how bad these replacement refs are, is unacceptable and shows a lack of maturity. Getting that cleaned up was a necessity. Now we just gotta get 3rd down pass D cleaned up. Way to many conversions for Dallas yesterday. I think at one point they were 7/11. That would get you mauled most days. 2nd half was better, but that's mainly cuz we had the ball forever. yeah the penalties were a tail of two halves, in the 1st half we had 4/30yd, and in the 2nd half just 1/15yd which was a complete B/S call on Sweezy for an illegal chop-block .. But what really won this game was the run game in the second half, our run game looked like it did at the end of last season just dominant, the Cowboys defense couldn't stop it even if they wanted to, they had no answers for it , loved it!. Did any of you watch Game Day Final? Marshall Falk the Ram's homer said the Cowboys played down to us no respect. If Tate used his helment to block lee, lee's jaw would of been shattered. Lee's head whipped back due to the whip lash. Wilson was past the LOS which is important because Wilson can't throw a forward pass causing lee not to be defensless. I don't know what the big deal was since lee was playing again and there is a reason for that, Tate went for the numbers not with the crown of his hat or lee's knee. NFL said this was a good block per the rule. I agree! Look at Tate's block now. Is that all you guys have to complain about? Try focusing on your teams struggles rather than a call that didn't go your way. You really didn't see the post three above you saying how it was a legal hit? That play didn't change the outcome of the game. We had our chances and we didn't take advantage - but that was not a legal hit. Old school - sure. But if you change the rules, you need to enforce them.